We’ve discovered that since adopting a puppy that we’ve become more outdoorsy. A dog requires us to be active and not a day goes by where we don’t walk Doctor to the park and log in over 3 miles in the process. 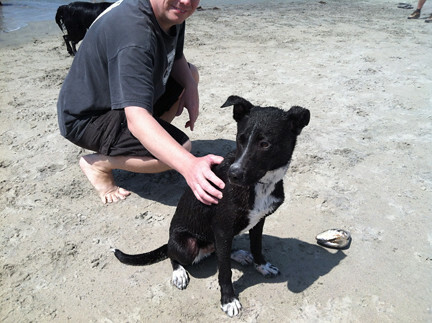 And on special occasions, we even make a trip to to beach so he can interact with other dogs and experience swimming in the ocean. On a recent trip to Coronado Dog Beach, we checked out Delux Gourmet Hot Dogs, located right on the main drag on Coronado at 943 Orange Avenue. Delux specializes in duh, hot dogs. But they also serve hamburgers, salads as well as some amazing sandwiches. But I was here solely for their Tokyo dog ($5.49), an all-beef dog with teriyaki glaze, Japanese mayo, grilled onions, sesame seeds, sriracha and topped with nori. The flavors are well balanced and the addition of brittle seaweed adds some nice crunch. My only qualm is that I wish they had split grilled the hot dog. It’s a pricy dog but considering its location, is a good deal. 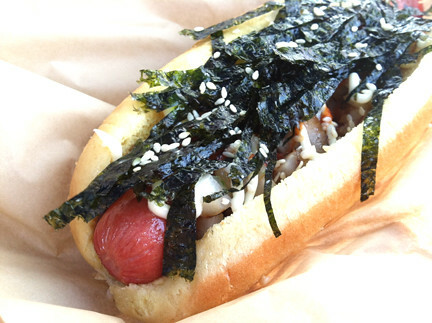 The Tokyo dog is the closest thing that San Diego has to a Hapadog, a Japanese take on the American standby. Also seen a while back was the Weinermobile. This one was seen downtown by the courthouse, locked up and unattended. It won’t be back in San Diego anytime soon but you can track its next location here. Awww, the Doctor is so cute! He’s a great excuse to get exercise in too, eh? Haha, we saw the Wienermobile about 4 years ago during one of our vacations. We were on a side trip to Madison, Wisconsin and it was going down the main drag during some sort sort of parade. We caught the tail end of it (pun intended). Yes, we get so much exercise! And not to mention the occasional sunburn too unfortunately. 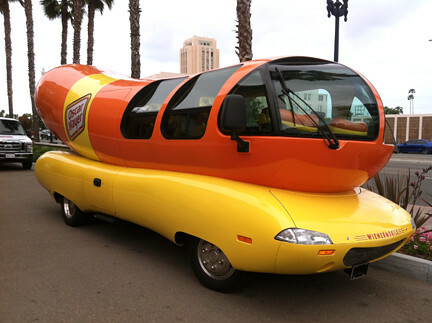 Remember the old Weinermobile? The new ones are at least streamlined. We caught a glimpse of the Wienermobile when we went up to LA recently – it was stuck in traffic on the other side of the 405 freeway! 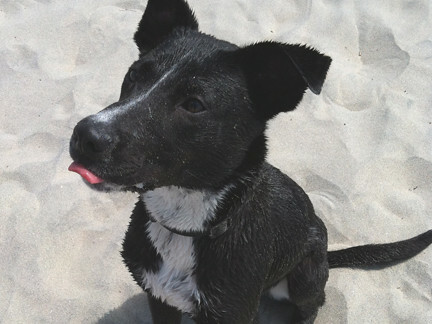 Doctor is super cute – looks like he’s enjoying the beach, too! We usually head over to Dog Beach in OB – need to try and check out the one in Coronado some time.